To a Nutribullet or blender, add blueberries, Greek yogurt, lemon juice and lemon zest. Blend thoroughly. In a large mixing bowl, add eggs, almond milk, Kodiak Cakes mix, vanilla extract, poppy seeds, salt, and blueberry lemon yogurt mixture. Stir until completely mixed with no clumps remaining. Heat a large skillet (or griddle) over low-medium heat. wait 2-3 minutes for the pan to heat up and then coat with non-stick cooking spray. Spoon approximately 1/3 cup of batter on to skillet or griddle for each pancake. I cook my pancakes two at a time since I don’t have a griddle. Let the pancakes cook for approximately 3-4 minutes. Flip pancakes when bubbles form on the surface and do not fill with batter, and the edges are no longer shiny. Cook for another 2-3 minutes, checking the bottom for golden brown color. Repeat until your batter is gone, spraying the pan between each set of pancakes. Recipe makes approximately 8 pancakes. 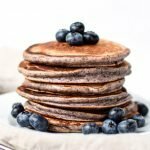 Prep: You can meal prep and freeze the pancakes, then pull them out of the freezer as you need them.